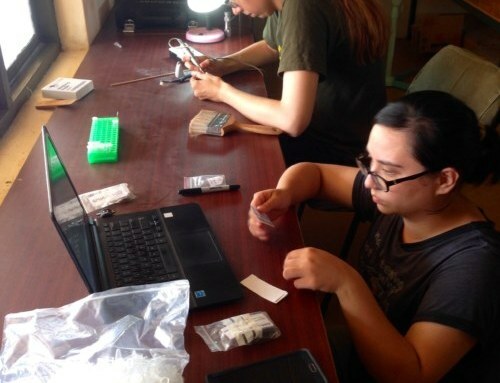 After a few classes, lectures, and labs, it was time for the students to try out their new skills in the field! 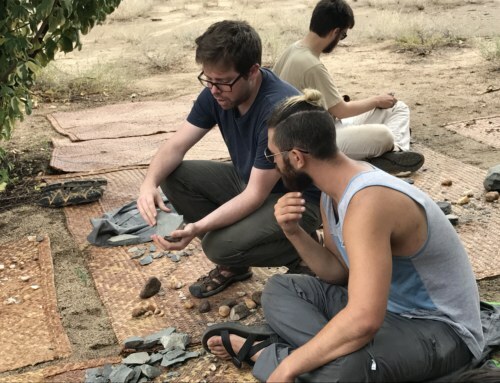 TBI Turkwel is situated on the banks of the Turkwel river, right on the cusp of some rocky outcrops with sediments dating to around 3 to 4 million years old. Tuesday morning, the students packed up water and sunscreen and went looking for fossils just outside the fence surrounding campus. 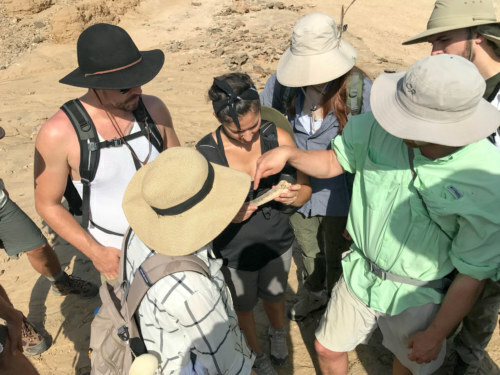 Though the students were all eager to find ancient bones, Dr. Lewis first led everyone through a review of the geology they had learned in class. We traced the layers of sediment surrounding us, seeing how the dry landscape around us changed as we moved upward through time. 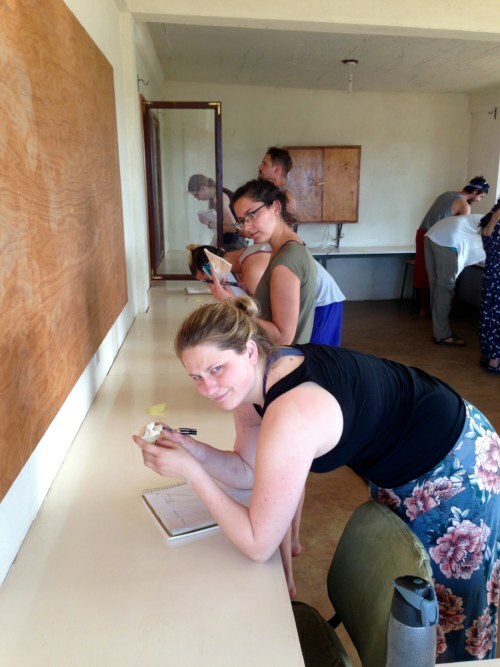 Kelly (front) and Petra (second) are quizzing their knowledge on mammalian osteology (photo credit: Dorien de Vries). Students are taking a quiz on the identification of mammal bones (photo credit: Dorien de Vries). Exploring the outcrops around the TBI Turkwel campus. Note the stratigraphy of the different colored layers in the sediments (photo credit: Dorien de Vries). 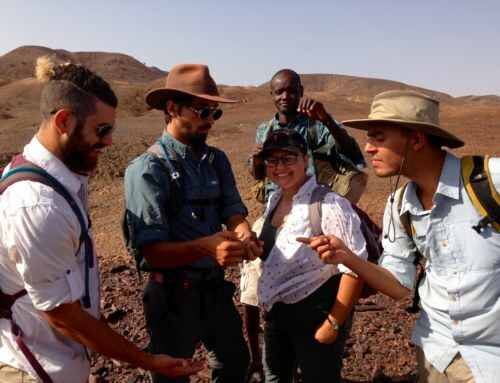 Dr. Lewis walks the students through the different geological layers in the Turkwel outcrops (photo credit: Evelyn Glaze). 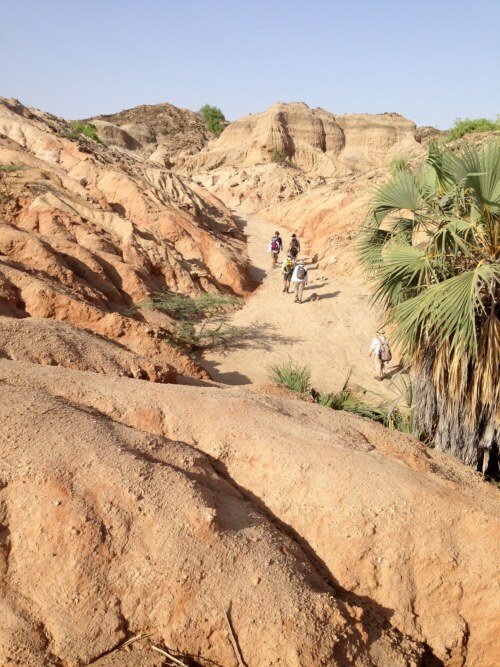 The students explore the Turkwel outcrops (photo credit: Evelyn Glaze). The students spent some time here scanning the ground for ancient bones. It took some practice, but soon everyone had gotten the hang of spotting fossils in the sea of pebbles covering the surface. Most of the first fossils we found were from fish and crocodiles. Dr. Lewis then directed us to some fluvial sediments that had been laid down by river activity, rather than the lacustrine (lake) sediments where we were finding all of the aquatic fossils. By directing our efforts to places where terrestrial remains were more likely to have been preserved, we quickly stumbled upon a huge expanse of terrestrial mammal fossils. The perfect opportunity to test the students’ knowledge of mammalian osteology! 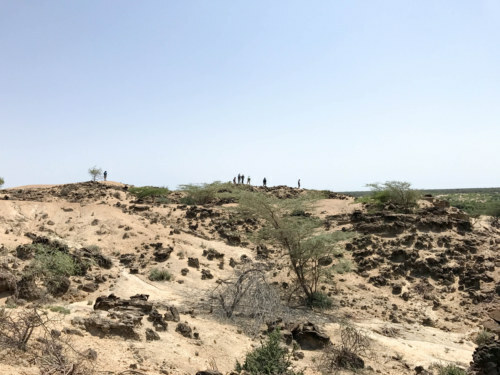 Students in the middle of 3 to 4 million-year old outcrops around TBI Turkwel campus (photo credit: Dorien de Vries). 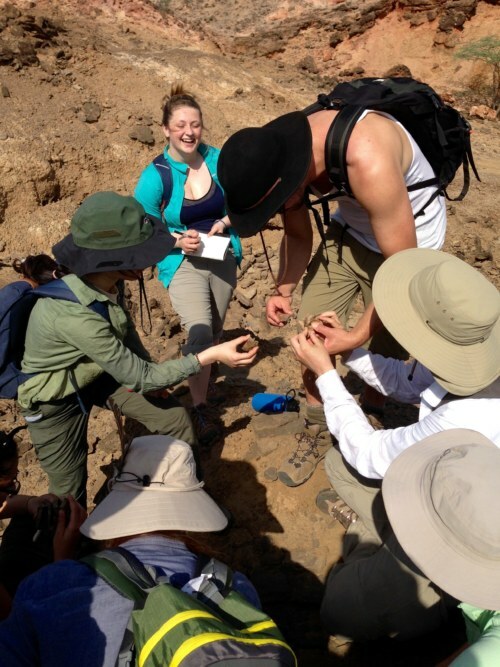 Dr. Lewis teaches students how to identify the species of fossil bones that they had found (photo credit: Evelyn Glaze). Petra and Adrianne look out over Turkwel outcrops (photo credit: Evelyn Glaze). 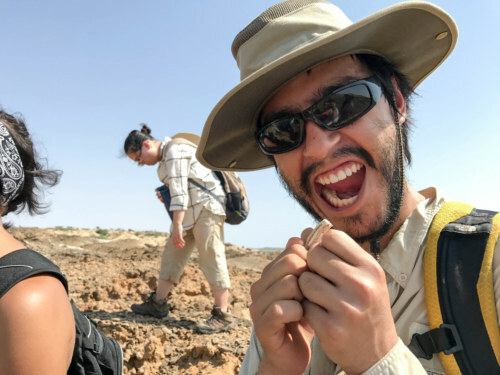 The students were able to identify teeth and skeletal remains from several types of animals like suids (pigs and warthogs), bovids (browsing hoofed animals including antelopes and cows), and equids (horses and zebras). 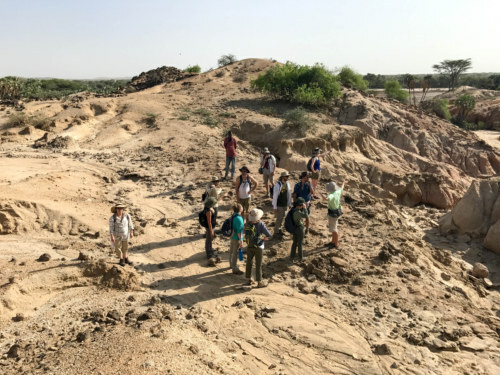 After the students had their fill of fossils for the day, we walked back to campus up the currently dry riverbed of the Turkwel river, observing this amazing real-life example of how the movement of water lays down sediment. 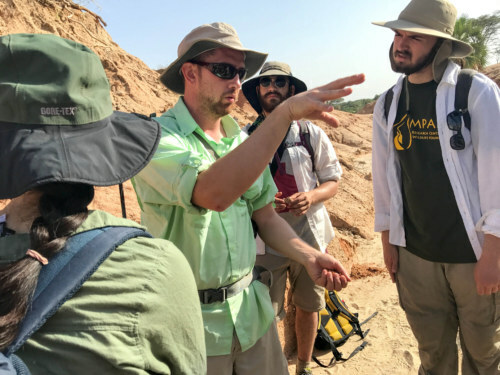 Once back on campus, and after a quick shower, the students continued with more lectures from Dr. Lewis on the paleoecology of East Africa. In the evening, they relaxed by playing with the two dogs Tom and George and playing our two favorite games — Connect Four and Dungeons & Dragons! 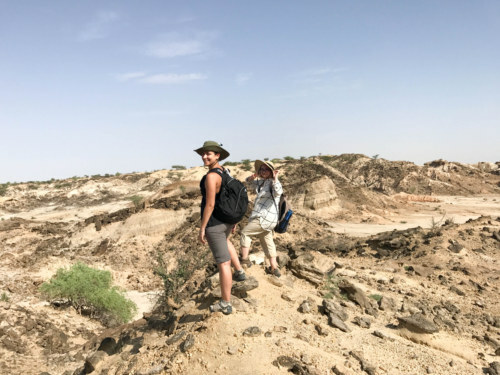 Exploring the Turkwel outcrops (photo credit: Evelyn Glaze). 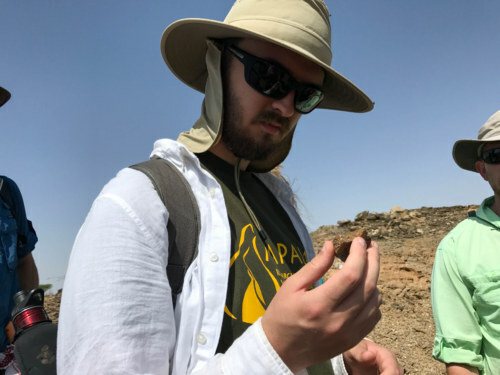 Nathan studies a fossil bone fragment that he has just found (photo credit: Evelyn Glaze). 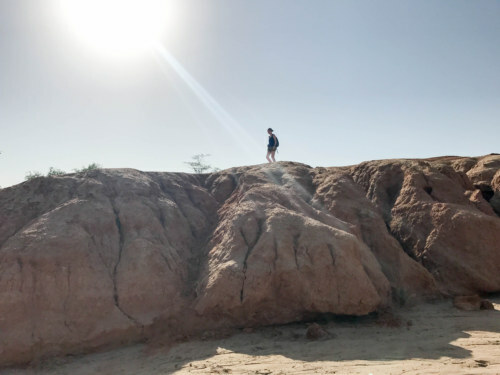 TA Dorien exploring the Turkwel outcrops (photo credit: Evelyn Glaze). View of the Turkwel outcrops and the (very dry) Turkwel river (photo credit: Evelyn Glaze). 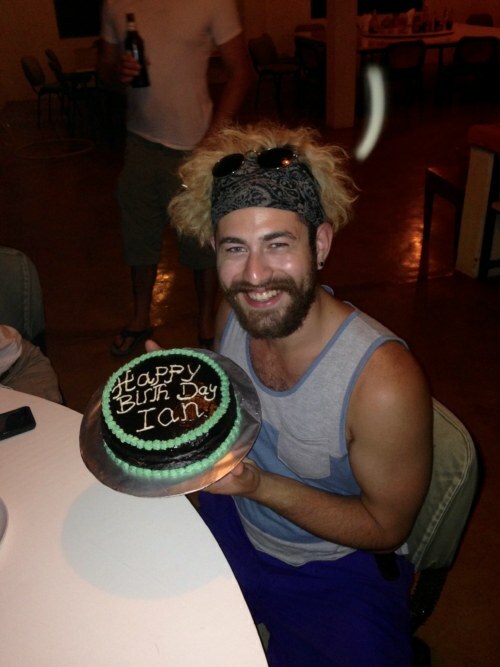 One student ­— Ian Passe — turns 21 this week! For Ian’s birthday, the kitchen surprised us all with a chocolate cake. It was a pleasure to celebrate this special day with Ian, who we all love for his exciting hair, hilarious jokes, and love of bonobos. Happy birthday Ian!! Birthday boy Ian blows out the candles on his birthday cake (photo credit: Dorien de Vries). Ian with his beautiful (and tasty!) 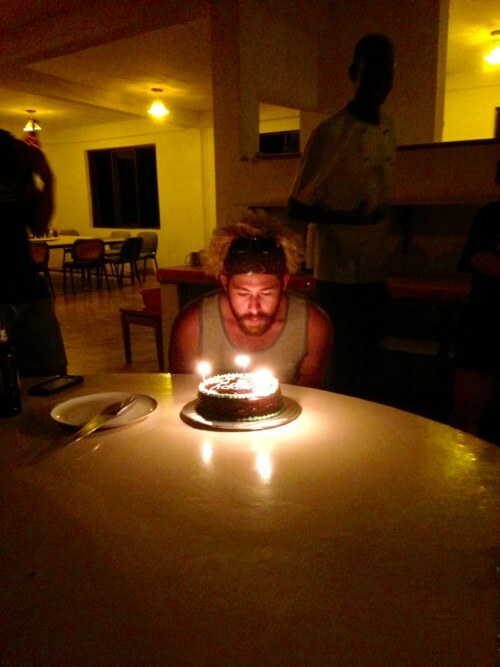 birthday cake (photo credit: Dorien de Vries). This week has been a lot of classwork, but stay tuned for more blog posts as the students start to apply what they’ve learned more in the field! I am a PhD candidate at Stony Brook University and am currently the TA for the Origins Summer Field School - 2017. I study the dental evolution of early primates and rodents in Africa and South America. 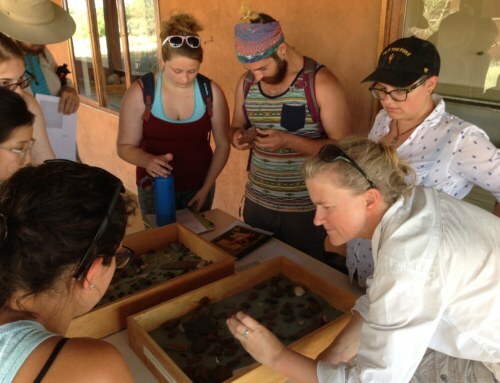 I love being in the field and have had the pleasure to work on excavations in Wyoming & Utah, Madagascar, and Peru.